Just a few quick snaps from Instagram I took Valentines week. I went down the country for a nice relaxing break and cuddled up by the fire with some movies. Went out for a delicious meal. How nice does it look!? Here are some of my recent purchases. Picked up this top in Zara. Love the subtle colours and its longer at the back which is perfect for layering. The jeans I picked up in Dunnes. They have a great fit, that I'm actually thinking of going back to get them in blue too. This jacket is a great find. It reminded me of a Helmut Lang wool tuxedo jacket one I saw but without the price tag. It reworks the classic blazer while it's raised back and unique shape make it very versatile. Lastly, if you saw my last post, I decided to try the lilac nail varnish first. 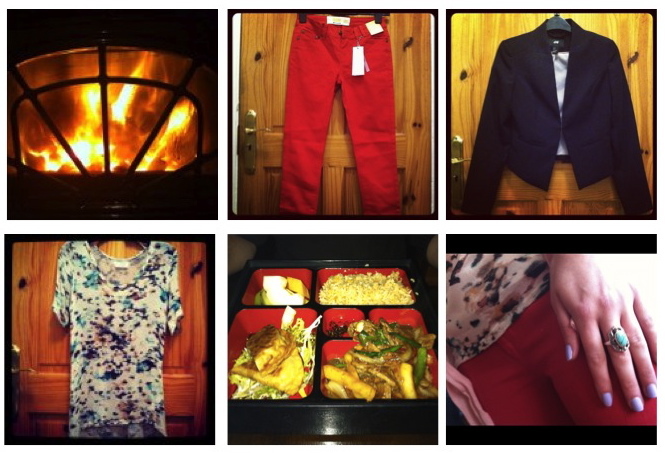 Top (Zara), Jeans (Dunnes), Blazer (H&M). I love the red pants! I was nervous myself to try them out, but they are too cute! Very bold & fun! I love you lilac nail polish- a great color choice. Hope you're having a good Monday, and thank you for stopping by my blog! Love the blazer & red jeans. Thanks for following me, now following you back! I've just got into Instagram...soooo addictive! Love the red pants! I have a red pair from Zara that are great! *Thanks for your comment on my "printed pants" post! i'll be coming back for sure!